Yesterday, Paul Ryan pulled the American Health Care Act at President Trump’s request before it could be voted on. It did not have the votes to pass and with good reason. Even before it was pulled, the finger pointing started. Trump mentioned a lack of loyalty on our side and blamed the failure of the bill on the Democrats. The Tuesday Club Republicans blamed the Freedom Caucus and true conservatives for not voting for what I view as a turd sandwich. Everyone was quick to blame Paul Ryan and to say that President Trump was without fault here. Especially Sean Hannity who ran interference for the GOP healthcare bill failure. Many conservatives cheered the bill being shot down. I didn’t want it to pass either, but as JD Rucker correctly points out, this is not a time for conservatives to cheer their “victory.” Obamacare still exists and so does the personal mandate. The pain is going to get much worse before anything will be done now. Trump has said he will let it implode on its own because his bill was not passed. Unlike Hannity and others, I do blame the President AND Paul Ryan over this. Trump could have fully repealed this monster and didn’t. Now, everyone will suffer and what replaces this when it blows may very well be single-payer healthcare. Trump may not have a problem with that, but the vast majority of Americans do. Friday on Fox News Channel’s “Hannity,” host Sean Hannity used his opening monologue to react to House Speaker Paul Ryan’s decision not to proceed with a vote on the so-called American Health Care Act, which would have been the opening salvo for Republicans trying to dismantle the 2010 Affordable Care Act, also known as Obamacare. Hannity argued Republicans must make sure this doesn’t happen in the future and point to the flaws in the legislative process where improvement must be made. However, he emphasized the outcome was not the fault of President Donald Trump. 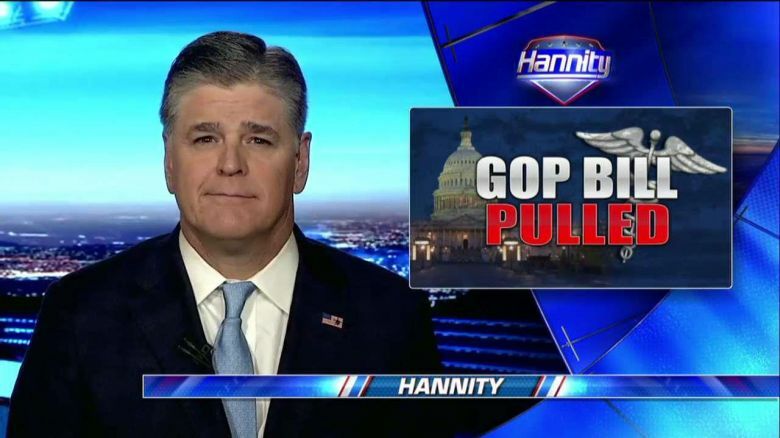 Hannity went on to take aim at the media and the Democratic opposition to the bill but reiterated that measures should be taken to ensure this doesn’t happen again. Trump says this is an opportunity and in a way, this works for him as it is sure to put him firmly in the driver’s seat. Perhaps as this thing blows up, the Democrats will strike a deal as Trump suggests they will. Maybe not. I can’t help but feel like this is the Titanic and we don’t fully realize we are sinking yet. The true constitutional conservatives in the Republican Party should be bracing themselves and preparing for a bigger battle to come. Trump must begin building the case for the full repeal of Obamacare if he wishes the Party to remain intact. Lay the blame on the Democrats where it belongs, but remember… Americans voted for a full repeal of Obamacare and what they just tried to do in the House was not even close. In fact, it was lipstick on a pig.